As an early-stage investor, I’m fortunate to work with entrepreneurs as their companies are just forming. Our firm has invested in nearly 100 businesses, and many have gone through one or more accelerators. We’re proud to call Memphis home to nationally ranked ZeroTo510 Medical Device Accelerator, as well as Global Accelerator Network member Start Co., and several of our startups have gone through Y Combinator, 500 Startups, Techstars, and Plug and Play. When evaluating accelerator programs and offers, the most important factor is the startup’s need. While they provide access to hundreds of accelerator options, platforms like f6s.com have made it perhaps too easy for entrepreneurs to apply to several programs without giving it too much thought. That would be a mistake, as all accelerators are not created equally, and it’s important for an entrepreneur to first understand what their goals are for acceleration. Do your homework, as this choice is critical to your company’s success! Based on your startup’s stage, or the founder’s experience, you should evaluate the curriculum, or programming, offered by the accelerator. Many accelerators teach some variance of the Lean Startup model. It’s a great methodology, and you can read about it in a book, but if this is your first startup, there’s no substitute to being led through the materials by experienced facilitators and entrepreneurs. 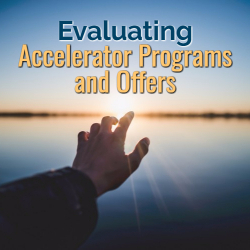 In addition to the standard textbook methodology, effective accelerators also have sessions on the practical side of developing a go-to-market strategy, business development, and sales strategy. These will typically come in the form of workshops that allow you to immediately apply the theory to your startup. Recommended Action: Ask the accelerator for a detailed overview of the curriculum, ideally in the form of an actual calendar from a previous cohort. Good accelerators also will tell you that Demo Day is not the finish line — it’s a ticket to enter the race that’s just getting started. What resources are available after Demo Day? The first 30 days after Demo Day are critical, as you will lose a lot of the bootcamp energy and momentum. At that point, it’s all up to you. But a quality program will still be there to help guide you by setting milestones, providing office hours, reviewing investor decks, etc. Recommended Action: Ask the accelerator what specifically they do to assist companies after Demo Day. Cash offered by a program ranges from $0 to $250K typically. More is better, right? Well, that all depends on the terms. Whether the money comes as a SAFE, convertible note, or as common stock, there’s typically an implied valuation. Make sure to talk to an experienced advisor, lawyer, or investor to ensure you understand the implications and strings attached to the cash. There might be follow-on investment rights, share price protection, etc. In addition to equity for cash, many accelerators also ask for a small piece of your startup for being part of the accelerator. To evaluate the fairness of that ask, you need to look at all factors described in this article. If the program scores high on many factors, expect to give up 5-10% for being in the program. Recommended Action: Ask for both the cash and in-kind investment terms. One of the hardest things for a startup to obtain is the first paying customer. This is especially true if you’re in the B2B world. Many of the most successful accelerator programs have strong connections to the established business community in the region. They can provide safe introductions to startup-friendly executives in large enterprises that will be able to help you navigate the copious amounts of red tape that is between you and the first sale. While many accelerators have an impressive list of logos of corporate partners, and a lengthy page of mentor mug shots, don’t expect all those folks to be actively involved. Recommended Action: Get in touch with some of the founders of previous cohorts and ask them how easy it was to get connected to potential customers. Ask for concrete examples. Besides customer connections, it’s also important that a program provides capital connections. A program should readily volunteer stats on the average amount of capital raised by its cohort companies. Note that I said “capital raised,” not just “number of investors present at Demo Day.” Demo Days are fun to attend and easily attract investors, but that’s not necessarily beneficial to you as a startup unless these investors have historically written checks at the accelerator stage. Recommended Action: Review the past cohorts and look the participants up in Crunchbase to see if they raised capital. Make sure to not be blinded by the outliers that raise multi-million rounds the week after Demo Day. See if the startups raised at least a couple hundred thousand dollars to reach the next milestone. How many are still around and have active websites? I hope this post gives you some idea on what critical questions to ask of an accelerator program. You should do this both before you apply, as well as after being offered a spot. Should you be so fortunate to be accepted into multiple programs, it’ll be even more important to make a pros and cons list to help you make a decision. Pick what’s best for your startup; that may not always be the highest-ranked program. Jan Bouten has been been involved in funding 100+ startups since 2002, across tech, medtech, agtech, and biotech. He is currently a partner at Innova Memphis, where he co-founded the Top 25 medtech accelerator ZeroTo510. Prior to his investing career, he spent 10+ years in the high tech industry with roles in engineering, marketing and sales.